This herbivorous Kreature was designed for racing, pulling and high-speed combat. It is a majestic beast with a confident disposition, brimming with strength but also light on its feet. Its rough paws give it excellent traction on all sorts of terrain; it can manoeuvre along a steep, rugged mountainside as effortlessly as it can sprint across the open plains. At its top speed, it leaves shockwaves in its wake. 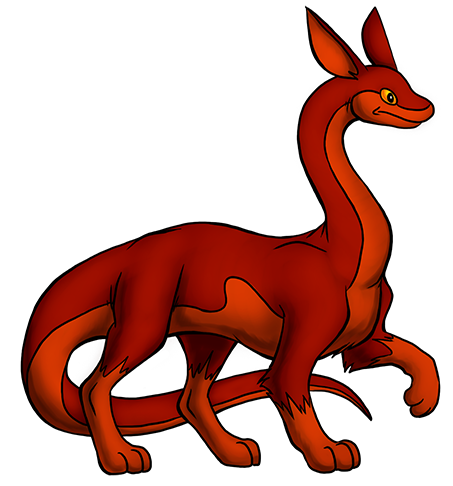 It is able to adjust the intensity of its fire breath, unleashing it in the form of explosive fireballs or a flamethrower-style stream. Though capable of swimming, it hates getting wet, preferring to keep its coat clean by rolling in the dust. Sweet design !! It’s pretty much a mammalian sauropod. Updated Comment: Bellere definitely succeeds in looking the part of a noble steed charging into battle. The paws, long thick tail, neck, and ears all look great.